These graphs shows show forecast of seasonal strong East Coast Winter Storm (ECWS) frequency. 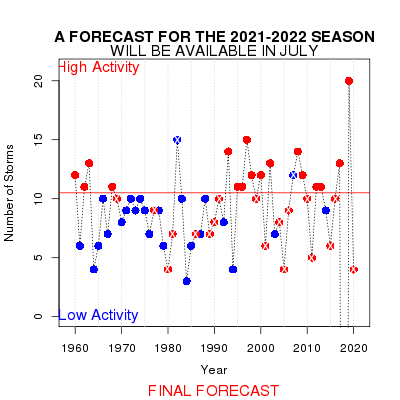 The time series view shows both the forecast for the current season as well as forecasts made during past seasons. The Predictor Variable View graphs show the combinations of predictor variables upon which the forecasts are based. The black line divides the scatterplot into the combination of variables that define high and low activity forecasts. Information concerning the identification of individual storms appears in Hirsch et al. (2000). Details on the relationship between storm strength and coastal impacts is given in DeGaetano (2007). • Number of storms OBSERVED in the current season. Early in the season (Oct - Dec), this point will likely be near zero. The position of the point will change through the current season. In the time series view, the 75th percentile of seasonal storm frequency. In active seasons the number of storms falls above this value. In the predictor variable view, the line dividing the scatterplot into combinations of variables that define high and LOW activity forecasts.